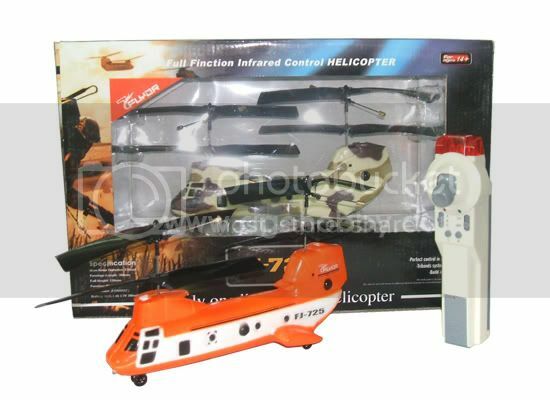 RC RADIO CONTROL REMOTE CONTROLLED 2 CHANNEL TRANSPORT HELICOPTER!!! Brand New! Not in stores yet! 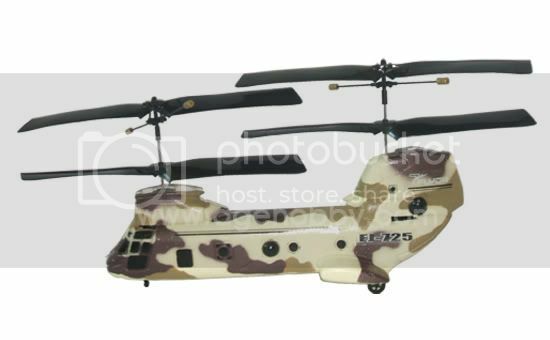 Be the first one to his this mini remote controlled Boeing CH-47 Chinook Helicopter! This New mini helicopter uses 2 counter rotating rotors powered by 2 electric motors. This unique design, makes it easy to control even in a small area. It is great for indoor flying in your home, office or any indoor location. It has a tiny Lithium Polymer rechargeable battery that can be easily charged through the controller. The controller has a recharging ability so it can charge the helicopter using it's own 4xAA batteries. It is infrared type controller that works perfectly in an indoor location. About 30 minutes of charging time will give you 8-10 minutes flight time. This AMAZING mini helicopter comes assembled and ready to use out of the box. All you need is 4xAA batteries for the controller and you are ready to fly. This Mini Helicopter comes in different colors. Colors may vary and depends on inventory status at time of shipping. If you buy more then one helicopter, we will put two different colors if available. You can send us your color request, we will try but we can't promise to ship the specific color. * Built-In 3.7v Li-Polymer Rechargeable Battery. * Infrared controller with recharging ability. This product is Only one living room transporter helicopter.